I haven't done a pencil drawing for ages so decided to do an ACEO in pencil. I thought this Emu was more suited towards a pencil drawing than a painting. I really enjoyed drawing again so I will do some more graphite aceo's. 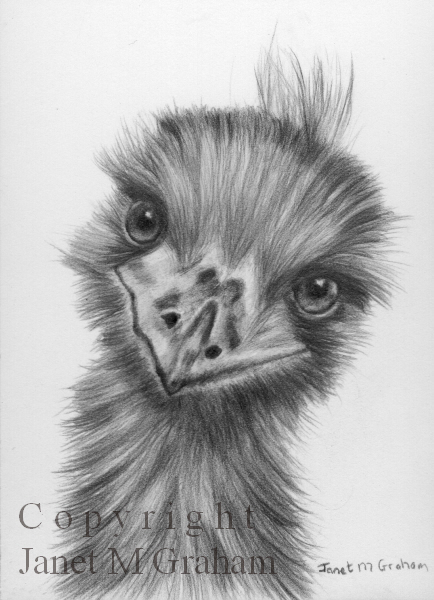 Emu ACEO measures 2.5 x 3.5 inches and is drawn on 250gsm Mellotex paper. Many thanks to Crias for the reference photo. I have had this still life set up in mind for a while and I am rather pleased how it turned out. The crackers and cheese were rather yummy to eat too. 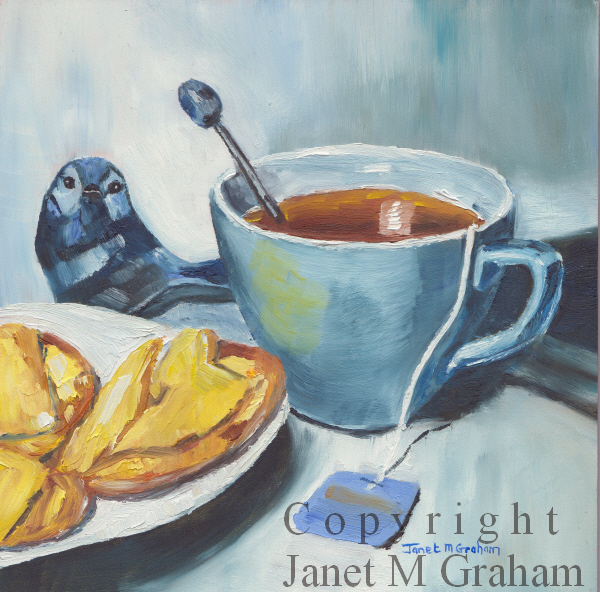 Tea and Crackers measures 6 x 6 inches and is painted on Ampersand Gessobord. Here is my next bird ACEO. 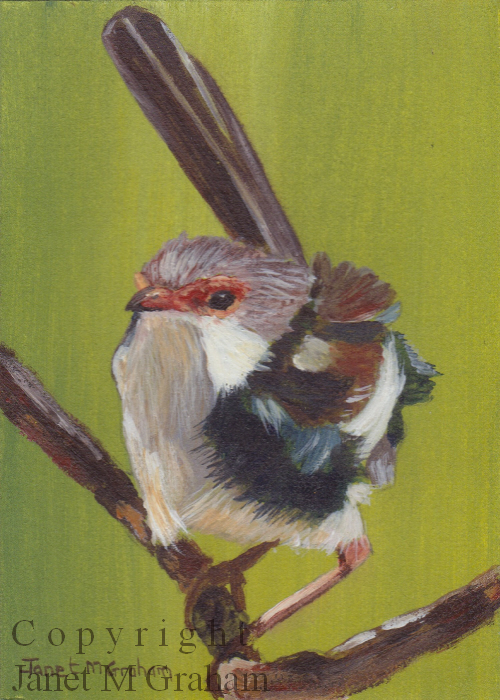 I must say that I love painting these little bird ACEO's. There are going to be a lot more too come. I have just ordered some smaller brushes from the UK so can't wait for them to arrive. I think the reason I love painting this small is because I have always preferred painting or drawing on a small scale so the ACEO size is perfect. 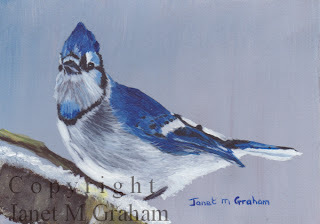 Blue Jay ACEO measures 3.5 x 2.5 inches and is painted on 300 gsm smooth Arches watercolour paper. This one was rather tricky to paint due to the colour of the cat and the size. I had to make sure that I added other colours to the cats fur to add some depth. I have found that a no 1 round brush is the brush to use when painting this small. I could do with one size smaller so I must order some more brushes from the UK. I think the title "Now What?" suits this little painting. 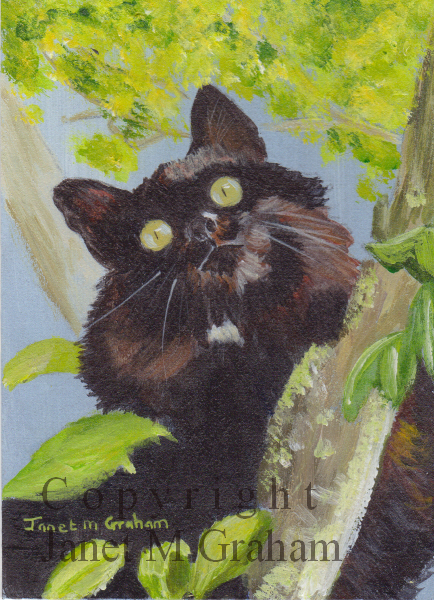 "Now What" (Cat ACEO) measures 2.5 x 3.5 inches and is painting on 300gsm Arches Smooth Watercolour paper. Many thanks to Freda Austin Nichols for the reference photo. Mandarin's are back in season so I thought it would be a good subject to paint. I was not sure if I should paint it peeled or whole but in the end I decided to leave it whole. Might do another painting with one peeled. Mandarin measures 5 x 5 inches and is painted on Ampersand Gessobord. This was one of the views from one of the beaches in the Bay of Fires region. It is a spectacular region in Tasmania. Bay of Fires region is known for its white beaches, blue sea and granite rocks covered with orange lichen. You can sit for hours on the beach just watching the sea and enjoying the peace and quite. 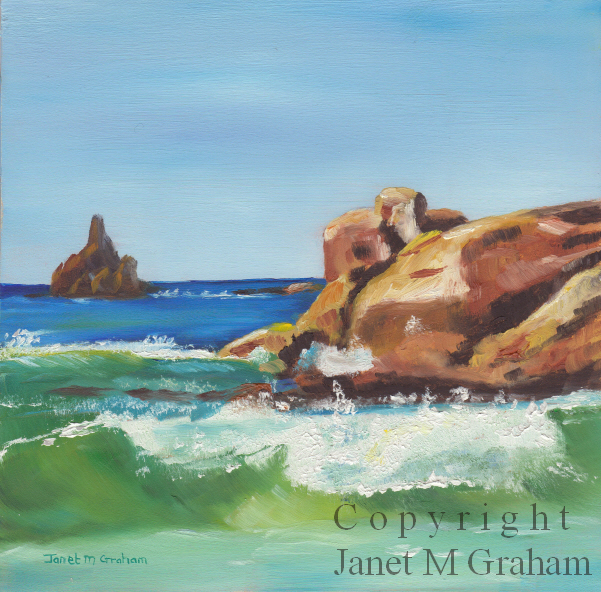 Bay of Fires, Tasmania measures 6 x 6 inches and is painted on Ampersand Gessobord. So for my next fruit painting I decided to paint a bunch of red grapes. It is actually quite fun painting grapes - I find it easier just to paint one grape at a time. 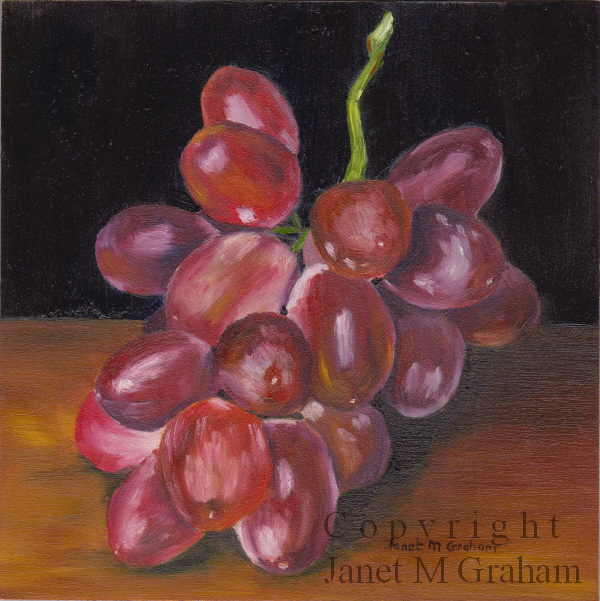 Bunch of Grapes measures 5 x 5 inches and is painted on Ampersand Gessobord. I photographed this beautiful tiger at Taronga Zoo, Sydney a few years ago. I am very happy how it turned out. Taronga Zoo is lovely place- would like to go back again - I didn't even manage to visit the Australian wildlife sections - spent too long watching the big cats. 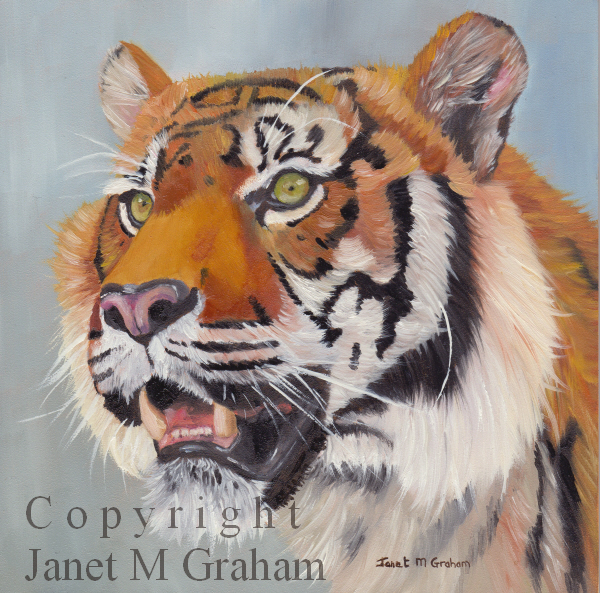 Tiger measures 6 x 6 inches and is painted on Ampersand Gessobord. This one has been on my to do list for a while so decided to paint it as an ACEO. I really enjoy painting birds and they seem suited to the ACEO size so I will have to look through my reference photo's for some more to paint. 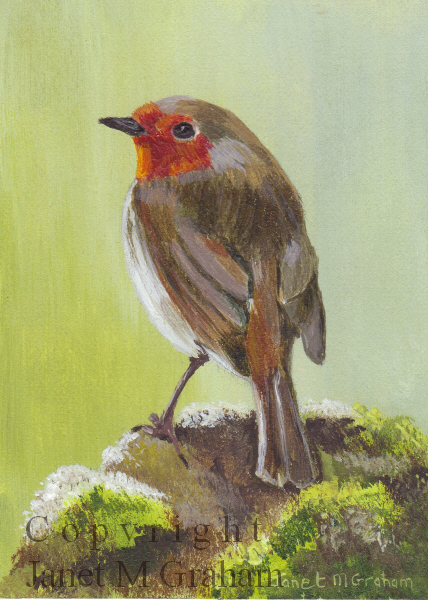 Robin measures 2.5 x 3.5 inches and is painted on 300gsm Smooth Arches Watercolour paper. Many thanks to ESP for the reference photo. I have had a squirrel scene in mind for a while and I eventually found the perfect squirrel reference that I could use. I enjoyed painting this little scene and it was fun to see it come together from my little sketch to the completed painting. 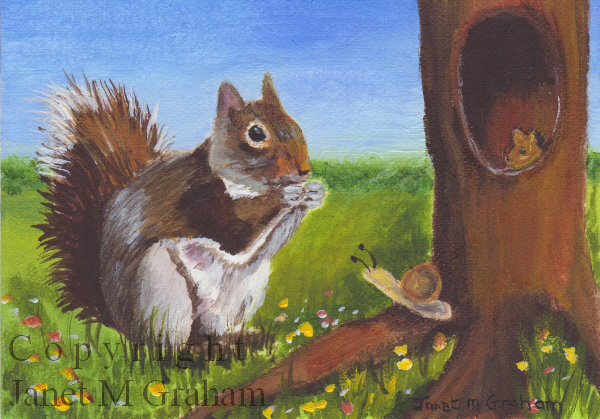 Squirrel ACEO measures 3.5 x 2.5 inches and is painted on 300gsm Smooth Arches watercolour paper. Many thanks to Nicola B for the squirrel reference photo. Here is my next fruit painting. I am very happy how this one turned out. I always find it a bit tricky when painting a red object as you can't just add white to lighten it - makes it too pink. I tend to use a combination of yellow and white to lighten red objects and it works really well. As I type this I can hear thunder so the weather forecast was correct - it is a bit strange to be having a storm in autumn but the weather has been a bit weird all year so why not a storm in autumn. I must go and check the windows as I can hear the rain coming. 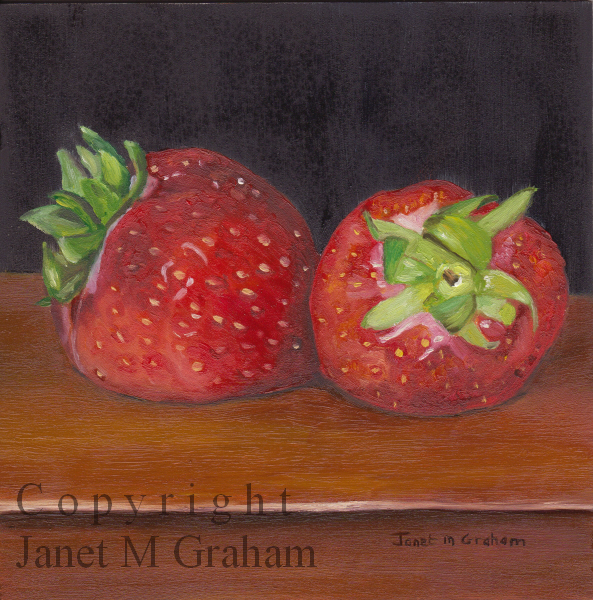 Strawberries measures 5 x 5 inches and is painted on Ampersand Gessobord. Many thanks to Tracee Murphy for the strawberry reference photo. I love painting fruit as I love the play of light against dark. I experimented a bit with the table top colour and in the process found the perfect colour combination which I think works really well. 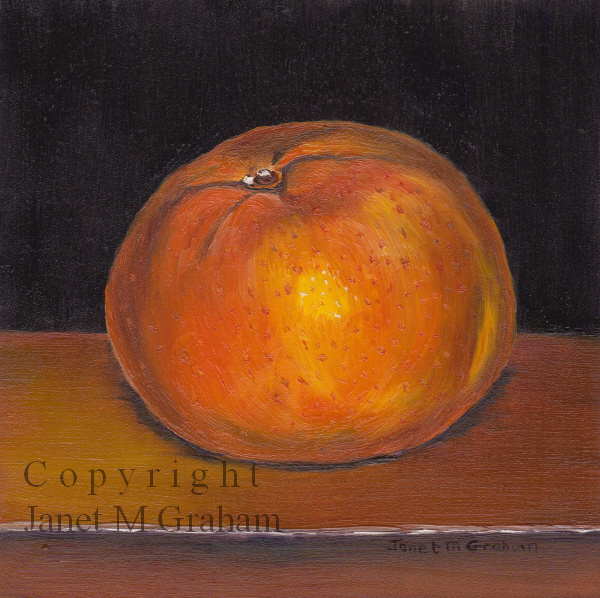 I really enjoyed painting this one so I am planning on using the remaining three 5 x 5 inch panels to paint some more fruit paintings. 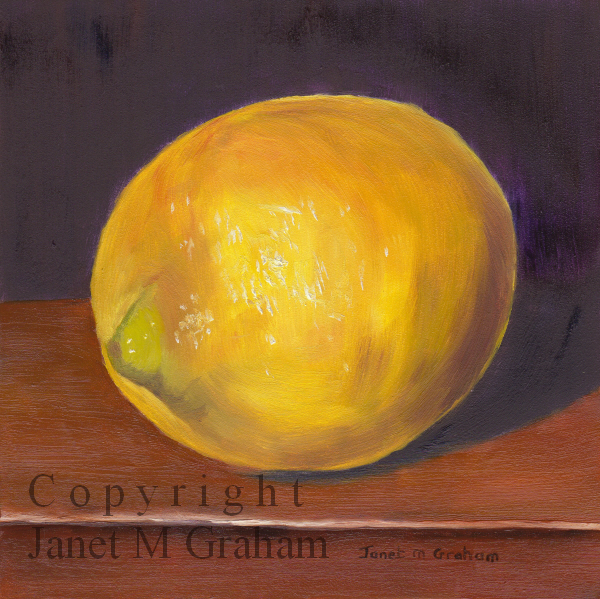 Lemon measures 5 x 5 inches and is painted on Ampersand Gessobord. I decided to paint a landscape for a change. I always find it rather amazing how a painting comes together. It goes through the "ugly stage" were you think this is not going to work, to were it suddenly takes shape and you wonder why you ever had doubts. This painting had a few "ugly stages" but I am happy how it turned out in the end. I will have to look through my reference photo's to see if I can find a few more landscapes that will suite the ACEO size. 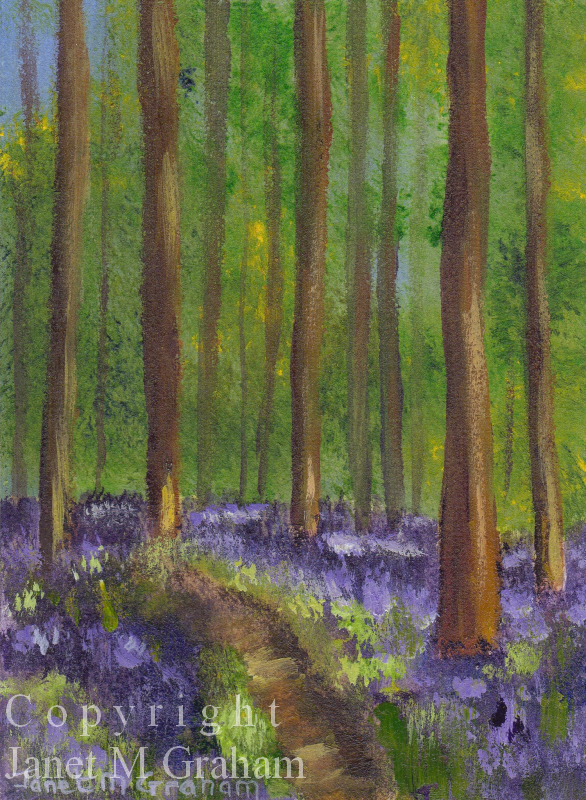 Bluebell Woods measures 2.5 x 3.5 inches and is painted on 300gsm Arches Smooth Watercolour paper. Many thanks to Richard Smurthwaite for the reference photo. I love the complementary colours of this one. It was the perfect one to paint as an ACEO. Again I did a wash for the background before painting the butterfly. To get the light into the wings I actually found a yellow glaze worked rather well. 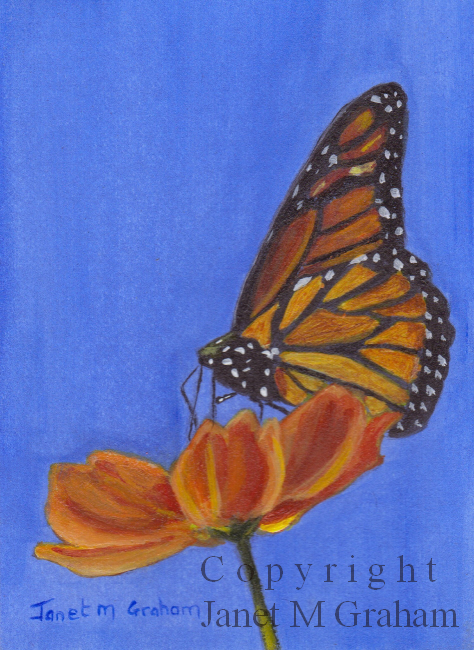 Monarch Butterfly ACEO measures 2.5 x 3.5 inches and is painted on 300gsm Arches Smooth Watercolour paper. Many thanks to Pamela Utton for the reference photos. I photographed this little wren a few years ago when visiting Canberra. They move so quickly so it is rather difficult to get a good shot. I am very happy how this one turned out. I thought it would be difficult to paint it this small but I actually found it ok - just used small brushes. Also it was easier to do a wash first for the background and then paint the little wren once the background had dried. Little Wren measures 2.5 inches x 3,5 inches and is painting on 300gsm Arches Smooth Watercolour Paper. These little animal paintings are fun to paint as part of the painting comes from my imagination. I just have to find the right animal reference photo that I can work with to complete the scene that I have in mind. 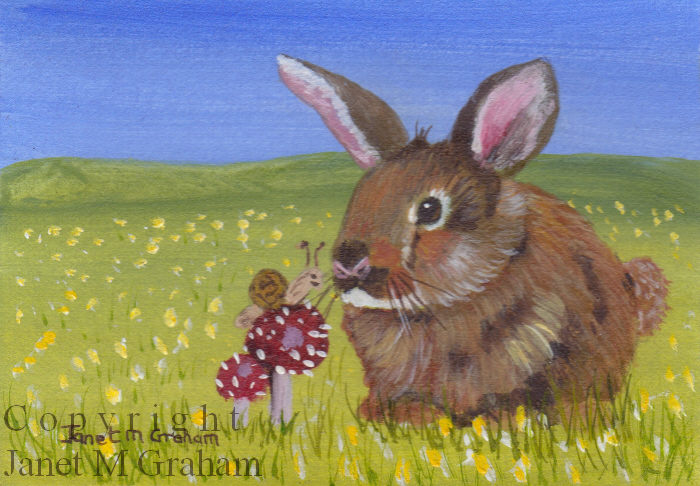 Bunny measures 3.5 x 2.5 inches and is painted on 300gsm Arches Smooth Watercolour paper. When I painted the Breakfast painting, I really enjoyed painting the teacup so I decided to feature the teacup in it's own painting. I love the colour of the cup. I will definitely be including it in another painting. 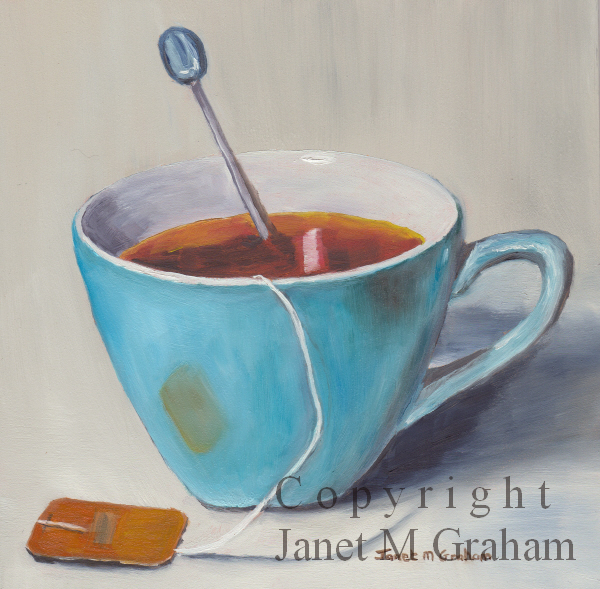 Cup of Tea measures 6 x 6 inches and is painted on Ampersand Gessobord.